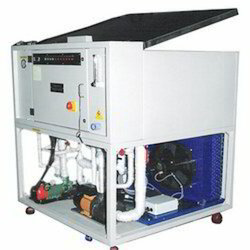 Pioneers in the industry, we offer brine chiller from India. Our organization is engaged in manufacturing and supplying premium quality Brine Chillers. The brine chillers offered by us are fabricated with the help of latest machines and tools using high grade raw material. Our team members make sure that the raw material used in manufacturing process is obtained from the renowned vendors of the industry.